I have been teaching piano lessons for 15 years and teach all ages and levels. I have both Bachelor and Master degrees of Music, both in Piano Performance. I am actively involved in local music associations and currently chair a festival in Broomfield in March as well as chair Achievment Day Festivals for Colorado State Music Teachers Association. Several of my students have won or placed in various local piano competitions. My studio is very active with many performance opportunities! Mrs. Amy Lee is an amazing piano teacher and a delightful person! She has taught my two children for six years and counting. She is able to challenge her students and bring out the best in them, while still making lessons fun. She also encourages her students to participate in festivals and competitions, and I have seen both my children grow with these experiences. 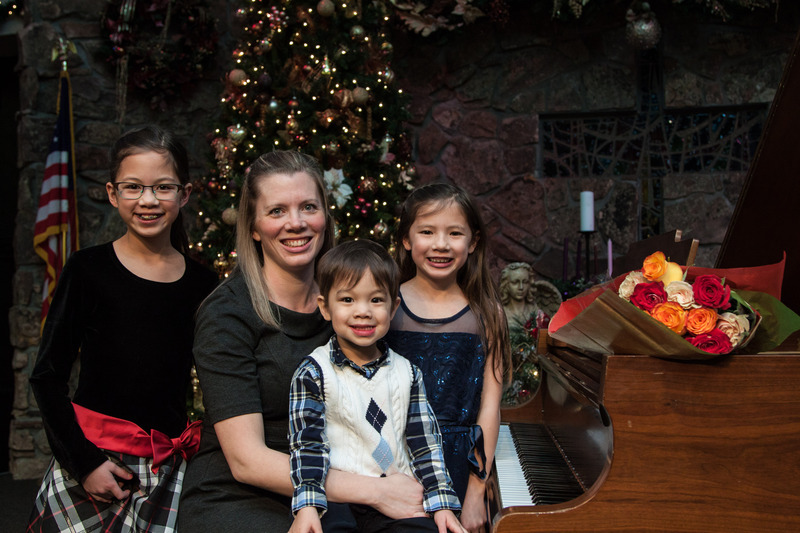 Mrs. Lee is truly passionate about teaching piano, and we are so grateful to have found her! Mrs. Lee is an amazing teacher. She challenges her students while focusing on proper technique. She cares greatly for her students and their families and instills a love of music in her students. Amy is truly a gem of a piano teacher. I have two boys that have taken lessons from her for over four years and have been nothing but impressed. Not only is she superb technically and clearly knows her stuff, but she's caring, personable, hard-working, and innovative. I am impressed with her ability to customize lessons to meet my boy’s unique needs and creatively find ways to help them grow - she truly goes the extra mile! I also love that she is patient yet firm and sets clear and high expectations. She brings out the best in my boys and I'm so grateful we found her! To enroll in lessons, I require meeting in person first (free of charge) to determine if the student/parents and I are a good fit for each other in regards to expectations, commitment, personality, etc. It's extremely important initially for students to find teachers with whom they mesh well to ensure successful lessons and good progress. I require my students have an instrument to practice on at home (with weighted keys), and I require consistent practicing each week. Montly tuition rates apply for 30 minute, 45 minute, or 60 minute private weekly lessons. I don't use "crutches" when I take on beginners - we begin building a foundation of being able to read notes and understand/apply rhythm from the very beginning. (I will not write all note names in the music, allow stickers on piano keys, etc.) All of those types of crutches prohibit strong reading skills. Learning to read music is equivalent to learning a new language. It takes time and effort! Other general requirements from teacher?